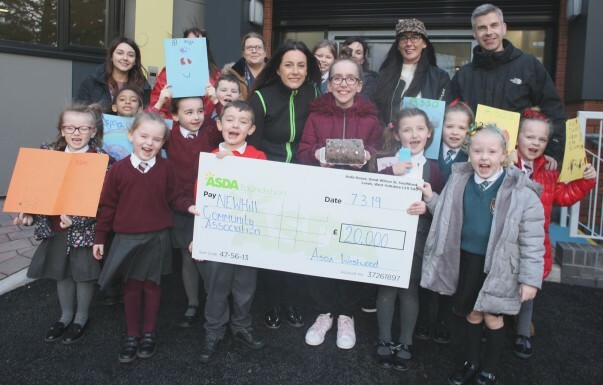 Our Westwood store's community champion Noeleen McMahon volunteers regularly with Newhill Youth and Community Association, which offers a creche, school holiday activities, a youth club, dance classes and more, and says she was delighted to present them with the cheque. Youngsters at the centre even designed their own thank you cards to give to Noeleen after hearing about the donation. Centre manager Jacqui Russell said: "We're a dynamic and important local facility open seven days a week. Our charity supports 30 children per day through our out of school service and over 80 young people a week through our youth club. "We have the Newhill Ladybirds 50-plus group that meets two days per week, with many in the local community also benefitting from our services and facilities – including fitness, dance, drama, and art groups. "As a direct result of the donation, we can fully furnish our newly-refurbished building with all the necessary programme equipment for the out of school service and youth club, including a new snooker table. Noeleen said: "It was a real honour to present the donation to this fantastic organisation and I really enjoy working with all the service users and volunteers. "The support offered by the group to the local residents is invaluable – and I am delighted that this substantial donation will help a much-needed support hub within our community continue to grow and develop."